THE MAKING OF PAPER…I THINK you will find this video quite interesting… the first time I took a paper making class I was amazed at the fact that while I was told to bring 12 inch squares of cloth ( which I bought in lovely patterns and colors think it would be used to CREATE the paper) ha no way it was used to couch your paper i.e. lay your wet sheet on to dry … lmao… so funny…and because it was a big class they just had us pile it up in a stack so and they helped us use the first one we came to so I didn’t even DRY my sheets on my lovely cloth… really funny … that’s how it was done with small group of 20. Every year for quite a while not sure how long there has been a WASHINGTON STATE CALLIGRAPHERS CONFERENCE…its open to all the WA groups and I am sure we would not deny any Oregon calligraphers either or even California…lol Its held at CAMP HUSTON which I believe is owned by the Luthern church AND its in GOLD BAR WA… its a beautiful setting and about 20-40 of my closest friends come to gather and share and play… for the last 3 or maybe 4 yrs we have extended it from friday to sunday to THURSDAY TO SUNDAY… so 3 whole nights and lots of time to share and play …sometimes there is a teaching moment and this year I am teaching a monoline class it will only be about 2 hours and since most of the attendees are calligraphers it is rather easy to teach… Monoline means just that only one line and it does not go from think to thin …there is no pen angle and the letters can be any size you want… the TOOLS are generally just a bullet tip ..ie ball point, pencil, colored pencil, gel pen, ruling pen etc… anything that writes basically but not with a chisel nib or even a pointed pen… you could use a pointed pen nib but you’d have to becareful not to allow it to make thick and thins… even a fountain pen is good . I taught these a lot at local scrapbook stores because scrapbookers for the most part don’t want to do formal calligraphy or spend the time and practice it takes to achieve good letters. 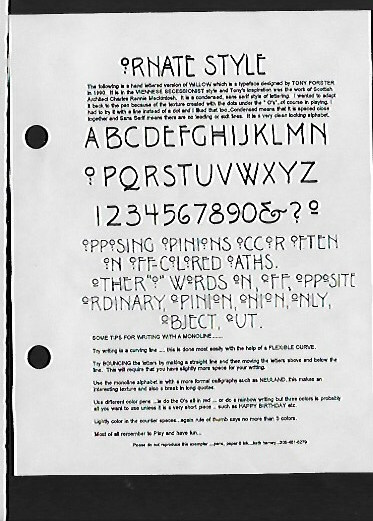 But monolines were quick and relatively easy and gave a nice look to their page which maybe their own handwriting didn’t. It also provide a lot of variety …so basically I am teaching a type of typography which in fact is where a lot of my scripts come from… I am especially fond of ART DECO STYLE LETTERS as you can see from my exemplar below. This entry was posted in Calligraphy, Eye Candy, Tools by kath. Bookmark the permalink. Hey Kath, I do follow you, I just haven’t ever clicked over to your blog post and I can’t leave comments from my e-mail. 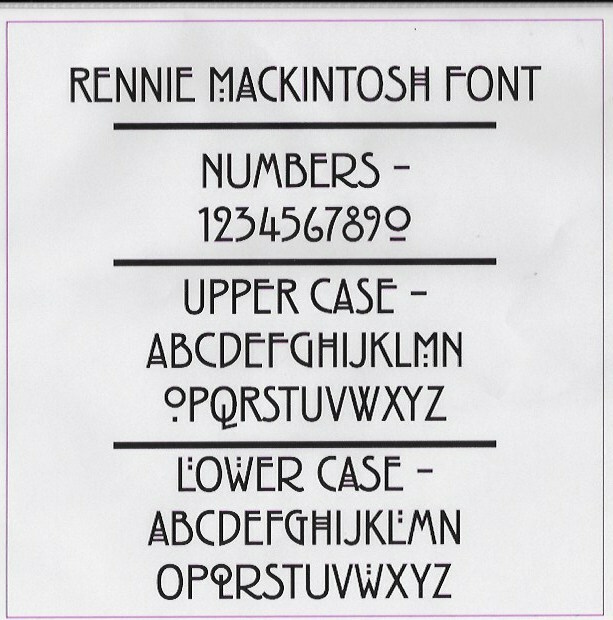 Thanks for posting the Mackintosh font. It looks like fun.